Back in 2015, I created a special version of Microlite74 designed for my Wilderlands of High Fantasy game. It was sort of a “Basic Plus” version in that it limited itself to the original three character classes of Microlite74 Basic and the original 0e boxed set, but used the more complete/complex rules from Microlite74 Extended. It also allow Magic-Users to select between four spell lists at character creation and clerics to select between two. A “special edition” of this game (entitled Microlite74: Perilous Adventures) with donated art was released for RetroRoleplaying Cancer Fund donors in the Spring of 2015. I panned to release a generally available version with public domain art about a year later. As it’s now the summer of 2018, I’d say the schedule slipped a bit — because I forgot all about my plan to release this game to everyone while working on things like moving to Ohio and other games. However, Microlite74: Perilous Adventures has been cleaned up, reformatted with public domain art, and is now available as a “pay what you want” game on RPGNow/DrivethruRPG. The rules have been slightly revised for this release and a few additional optional rules have been added. As normal, $0 (aka free) is a perfectly acceptable amount to pay. Get your copy of Microlite74 Perilous Adventures on RPGNow. Why download this game? 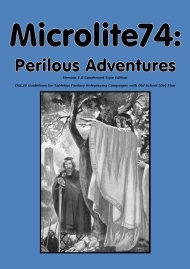 Microlite74: Perilous Adventures provides a look at a different path 0e might have taken. A path that expanded character design options without starting down the road that leads to a huge number of separate classes each with their own rules and other bits and bobs. The entire game — rules, spell lists, monsters, magic items, etc. — fits in a 72 page rulebook. Microlite74 games are trimmed-down miniature versions of the Primary Fantasy SRD rules designed to be quick and easy to play, especially when compared to modern incarnations of the game. The goal of Microlite74 games is to recreate the style and feel of that very first (“0e”) fantasy roleplaying game published back in 1974 without giving up all of the clearer mechanics of modern D20-based versions. These rules assume that the GM understands the basic concepts of roleplaying games, but provides information for both the GM and the players on the various “old school” styles of play. Microlite74 games can easily use adventures and material from early editions of the world’s most popular tabletop fantasy roleplaying game or modern clones. Next story A Second Edition of Microlite78 First Edition Lite?